Fig. 1. A handwritten meeting note from around the time the Korean Geriatrics Society was founded (February 1969). The dispatch date is shown in the top right corner (February 6), but the addressee is unknown. 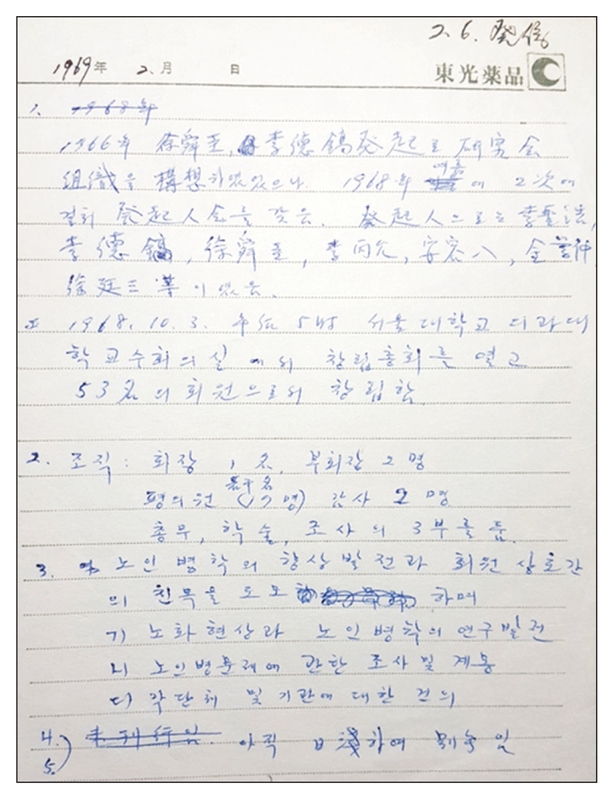 The first item of the note reads: Soon Gyu Seo and Deok Ho Lee came up with the idea to organize a research society in 1966, but it was in the summer of 1968 that 2 founders’ meetings were held. Sung Ho Lee, Deok Ho Lee, Soon Gyu Seo, Byung Yoon Lee, Yong Pal Ahn, Hak Joong Kim, and Jung Sam Seo were among the founding members. This note documents that Soon Gyu Seo and Deok Ho Lee laid the cornerstone for the foundation of the Society. The note-taker is unknown, but is assumed to be one of the founding members.